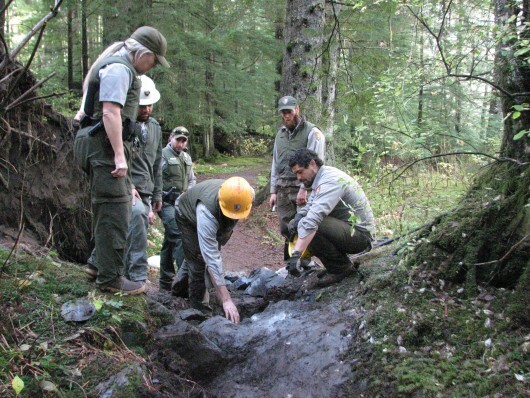 The National Park Service began work this week on the River View Trail in the Sitka National Historical Park. River View Trail runs along the west side of Indian River from the footbridge up to Sawmill Creek Road. The first half of the trail is smooth, compacted gravel – a jogger’s dream. The Park Service did work here in 2011. Now, they’ve returned to finish the job. The Park inherited half of this trail when it took over land owned by Sheldon Jackson College over a decade ago. Park users had forged their own trail connecting it to the Totem Park system. The Park Service decided to make both trails official. Chief Ranger Carin Farley spearheaded the project. “What we’d like to do is get people on an official trail instead of having social trails that go all over, allowing for damage to the resource,” Farley said. The crew is re-grading the trail, tearing out old wood stairs, and removing obstructions. The Park Service expects the trail will be finished in mid-November. NextBig Japan quake no threat to coastal Alaska, B.C.